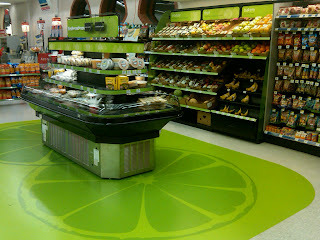 The Retail Expert's BLOG: Walgreens fresh.real.now--Can they crack the convenience fresh code? Walgreens fresh.real.now--Can they crack the convenience fresh code? A few months back, Walgreens announced a planned expansion into the food business. The first evidence of this was the announcement of expanded food offers in so called "food deserts", typical inner city locales in urban markets. The first half dozen or so of these have debuted in Chicago already. In a separate test, Walgreens also has planned an entry into the convenience fresh foods business. Imagine a place to buy fresh produce, sandwiches, salads and meals in nearly 7,000 Walgreens locations across the country, appealing to the time starved mom who is already shopping in their stores? That's the market opportunity being explored by these test stores. The first location opened at North & Wells in Chicago's Old Town neighborhood. A second was nearly complete at 30 N. Michigan and another seven were planned this year. While the area is branded fresh.real.now, individual products (entrees like pasta chicken marinara or lasagna) were branded under Corner Kitchen. The product generally looked fresh and appealing with reasonable prices. The branding certainly creates visibility and the location is prominent within the stores. The real question: will customers (those busy moms) trust Walgreens as a fresh food source in the same way that they trust the brand for pharmacy? While the product looked good, the Walgreens brand is not necessarily synonymous with fresh and many retailers have struggled with selling packaged products. And, selling fresh goods can be a killer when they have to be thrown away--we saw a lot of produce, as an example, that has a very short shelf life. We'll revisit again once they get these fully up and running. We suspect that there will be a lot of tinkering with the merchandise mix and that it will take time to build awareness (and acceptance) of the concept. their tomato basil soup is amazing!